Now, that’s a way to be remembered! Portrait of Götz von Berlichingen. However, that is a gross injustice. We cannot speak of Götz von Berlichingen, the man immortalized by the likes of Johann Wolfgang von Goethe, without mentioning his heroic and often dubious exploits. 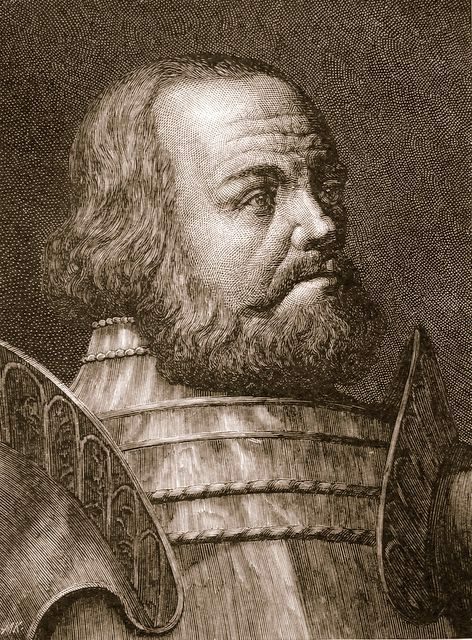 Götz von Berlichingen was a man who was up for every feud and fight. He thrived in battle and is considered one of the bravest knights of the Middle Ages. Götz von Berlichingen and the Swabian salute. Always the restless type, Götz rushed from one battle to the next. In a world where the traditional valiant knight was fast becoming obsolete, he fought for himself in pursuit of riches. His chosen role as a robber-knight brought Götz occupation, loot, and lots of trouble. Götz was born into the Berlichingen family around 1480 as the tenth child of Kilian von Berlichingen and Margaretha von Thungen. He spent his childhood in the Castle Jagsthausenm, in the monastery school of Niedernhall, and with his uncle, Konrad von Berlichingen. Götz at a younger age. His subsequent court service for the Margrave of Ansbach proved dull for the young and idiosyncratic Götz who soon became restless and left in search of more adventurous and richer pickings. He was only 17 years old when he departed on his first campaign in the year 1497. 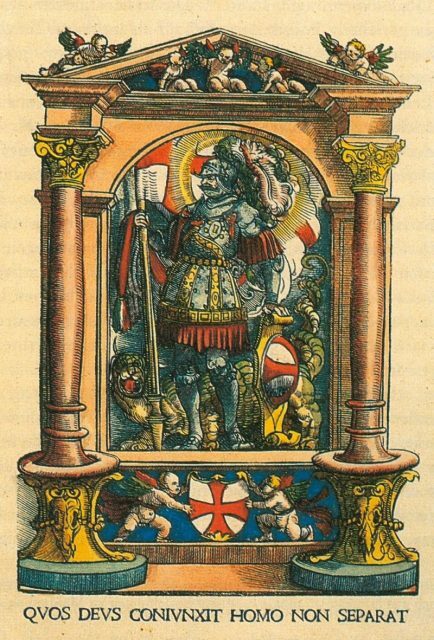 Götz served the then Holy Roman Emperor all across Europe in Burgundy, Lorraine, Brabant, and Switzerland. But that was not enough. Götz soon tired of regular military service. He had greater aspirations. Together with his brother, Philipp, in the year 1500, they encountered Thalacker von Massenbach. This man was just the person the brothers were looking for. He was an out and out robber-knight, who had made his fortune as a brigand by looting, hostage-taking, and plundering. As a member of this vile society, Götz was almost caught by gunmen in the service of the Swabian League. He managed to escape and sought refuge during the winter of 1501 in Castle Sodenberg, which belonged to a relative. 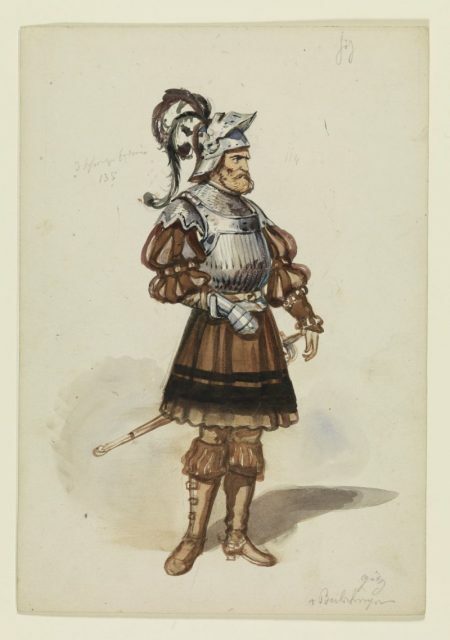 Costume design for Götz in Goethes Götz von Berlichingen. After that, he could no longer ply his trade in Swabia. It had become too hot for him since he was known as a robber-knight throughout the region. He needed to seek out new horizons. In 1502, Berlichingen entered the service of the Margrave of Brandenburg where he fought against the army of the city of Nuremberg. 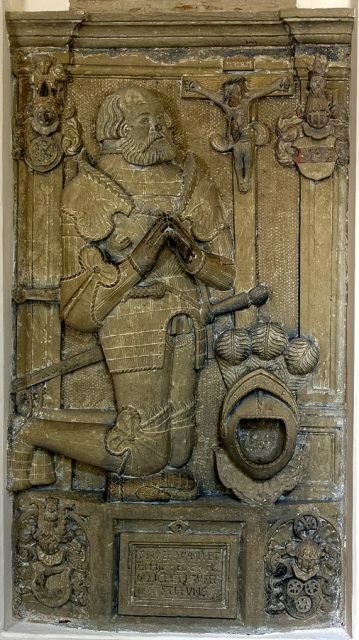 In 1504, he served under the banner of Duke Albrecht of Bavaria and participated in the siege of Landshut. 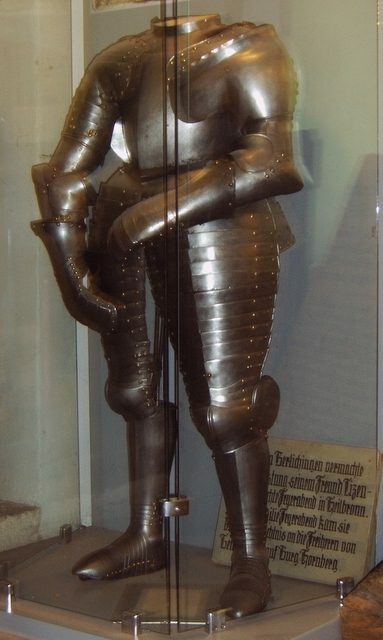 Original armor from Götz von Berlichingen to Hornberg. A serendipitous shot from a field cannon crushed his right hand which subsequently had to be amputated. However, other sources state that the cannonball actually hit his sword, causing him to cut off his own right arm. Whatever happened, the result was the same. 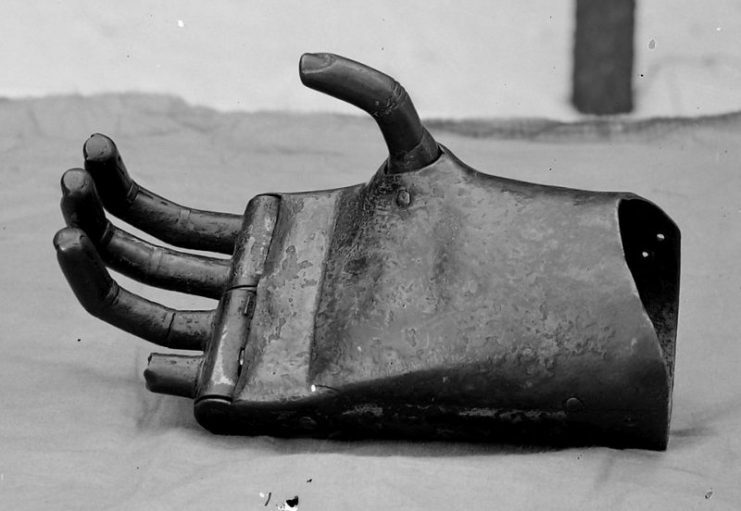 The second iron prosthetic hand worn by Götz von Berlichingen. 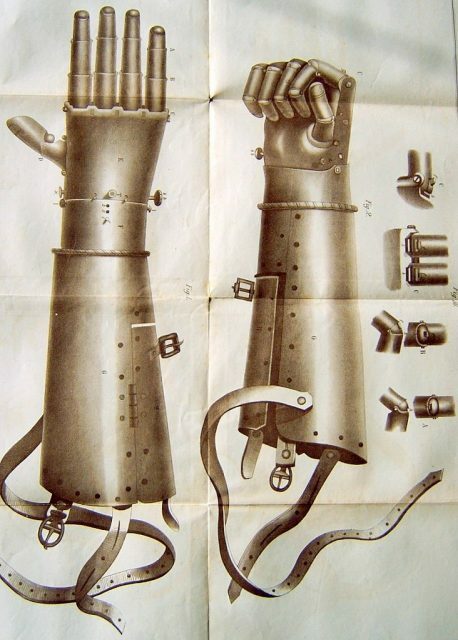 After several weeks stuck in a sickbed, Götz had a village blacksmith make an iron prosthesis. Typically, arm prostheses of that era consisted of a simple metal hook for gripping objects. 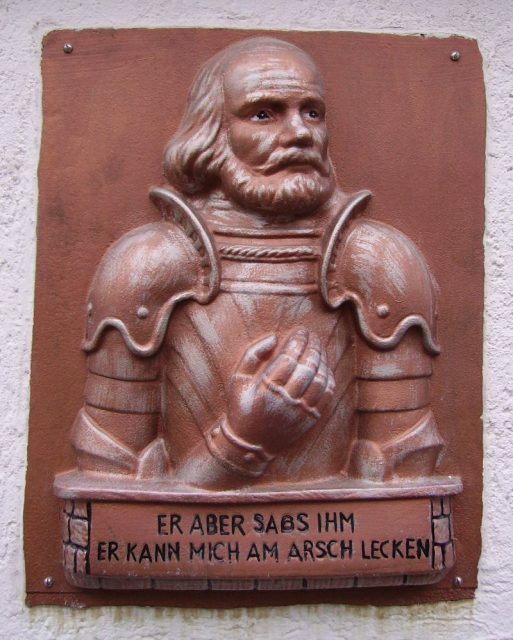 However legend says that Götz was able to take his sword once more and pursue the life he loved most, namely that of a warrior knight. 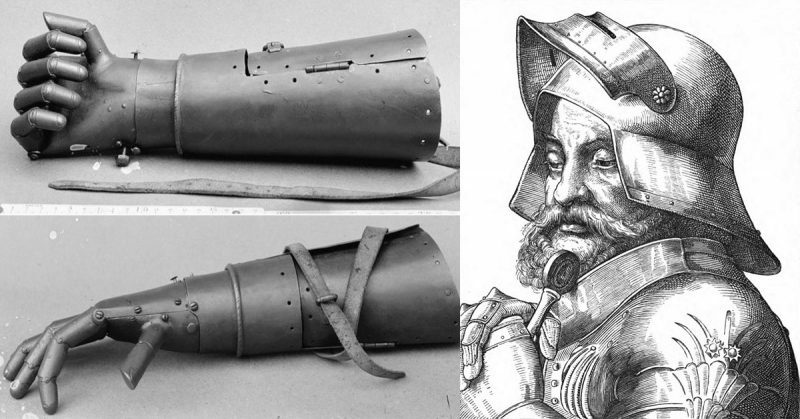 In Medieval Warfare Magazine there is an article concerning Götz von Berlichingen, they mention some research was made of how usable the hand would be, and found that while it was functional and could be used for some tasks (e.g. holding the reins), it was not strong enough to hold a sword or a lance, therefore questioning the legend of its use in battle largely as an embellishment. It would be enough to hold the sword during a parade, so maybe that’s the origin of such tales. A few years later, he had a second prosthetic made which included finger joints and allowed him to grip his sword more tightly. This model was considered an ingenious invention and is still around today, on display in a museum in Jagsthausen. In the following seven years he fought in 15 feuds, helping friends and honest folk against looters and kidnappers. However, he went too far when he raided 95 merchants at Forchheim in May 1512. As a result, Emperor Maximilian I ostracized him and had him imprisoned. After purchasing his freedom, Berlichingen later captured Count Philipp von Waldeck and held him for ransom, once more inviting the ire of the Emperor and being excluded from his domains. 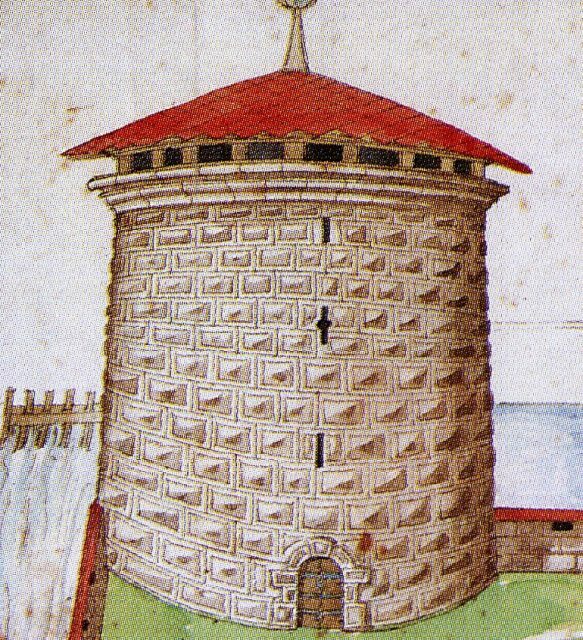 The bastion tower in Heilbronn , where Götz von Berlichingen was imprisoned. However, with extraordinary impudence, he continued his activities until a company of soldiers from the city of Heilbronn overwhelmed him in 1519. He stewed in the dungeon for the next three years until his friend, Franz von Sickingen, had him freed. 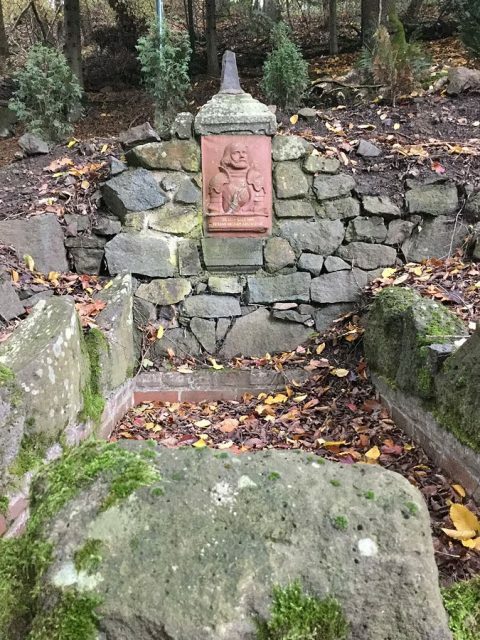 To gain his freedom, Götz had to swear “Urfehde” or an oath that he would never steal or plunder again, and that he would withdraw to his ancestral home of Hornberg am Neckar. In the spring of 1525, the great German peasant war broke out. When the “Odenwälder Haufen” or the Odenwalder Group, one of the most important peasant armies of the time, approached Berlichingen’s castle, he immediately joined up in the capacity of a captain. Later he told the story differently – according to him, he became the leader. However, Götz quickly realized that the peasants had no discipline. They were no army but a rabble of thieves that randomly plundered everything that came into sight. However, sometimes they made fun of captive nobles. In one instance, they dressed the Count of Lowenstein in coarse peasant smocks, handed him a shepherd’s crook, and placed him at the front of a flock of sheep. 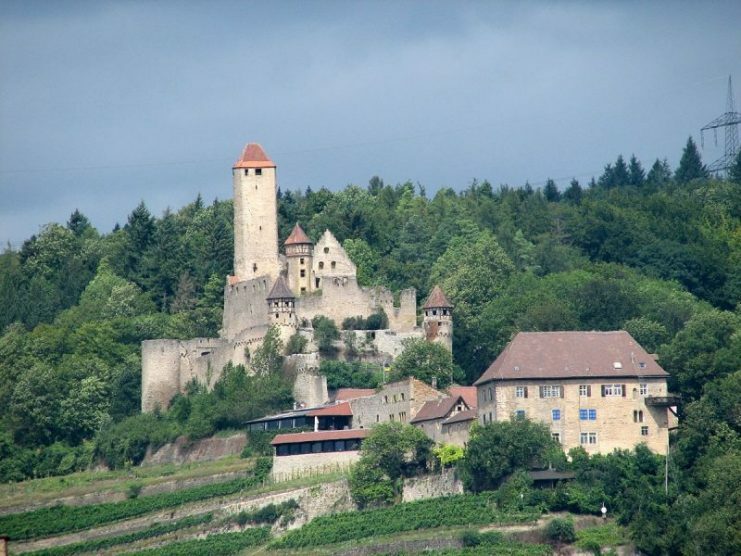 Götz stayed with the Odenwälder Haufen for a while and partook in some minor skirmishes against the Knights of the Swabian League, but after four weeks of chaotic operation, he’d had enough and returned to his castle. Coat of arms of the Swabian League. That, too, did not last long. Soon, Götz was bored, so he took off but was captured in battle in 1528 near Augsburg. There, he spent two more years in the dungeon after which he was released after making another oath that he would not leave his castle and the surrounding lands. At 50 years of age and as the father of ten children, he had become somewhat calmer. This time, he managed to keep the promise. For a while, at least. 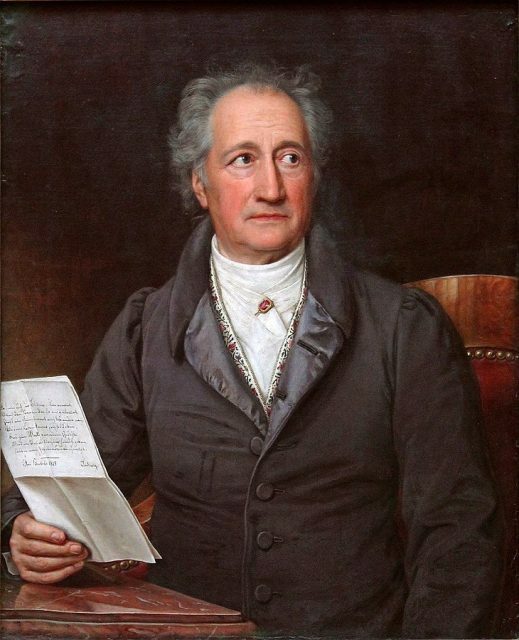 Johann Wolfgang von Goethe was the first to drag his memory out of obscurity. When Emperor Charles V moved against the Turks in Hungary in the year 1542, the famous knight could not keep his iron hand still. Longing for battle and glory, he joined the army and headed east. He even participated in the campaign against the French king in 1544. Götz von Berlichingen was never really able to retire. 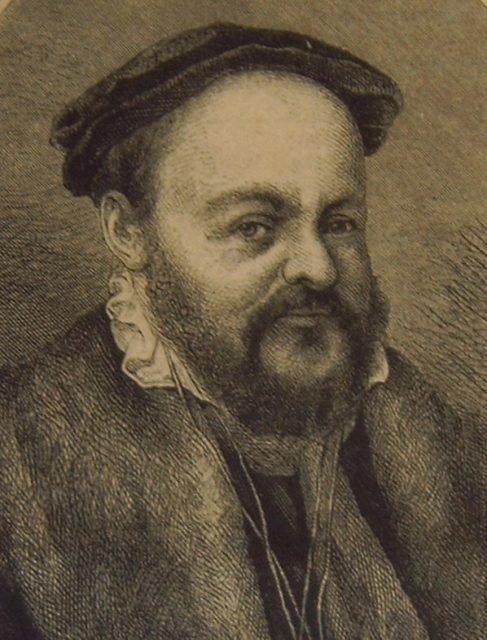 He hungrily pursued his passion for battle until his adventurous life ended at the age of 82 in 1562. One thing was for sure: he did not correspond to the ideal of the Christian nobility of the German nation that Martin Luther had coined at the time. In essence, Götz was a rogue, albeit a brave one. After his death, he fell into obscurity for a while until Goethe’s feverish drama brought him back into the public consciousness.